Paint curing oven statistics and drying speeds are a big concern for busy auto body shops. More the drying time is, less the cars are painted per day. Hence, the opportunity to earn more business is lost. Spray Tech / Junair came up with an easy solution for this problem. We introduced Quick Air Drying System (QADs) a few years back. QADs is an air movement management system installed in the booth. 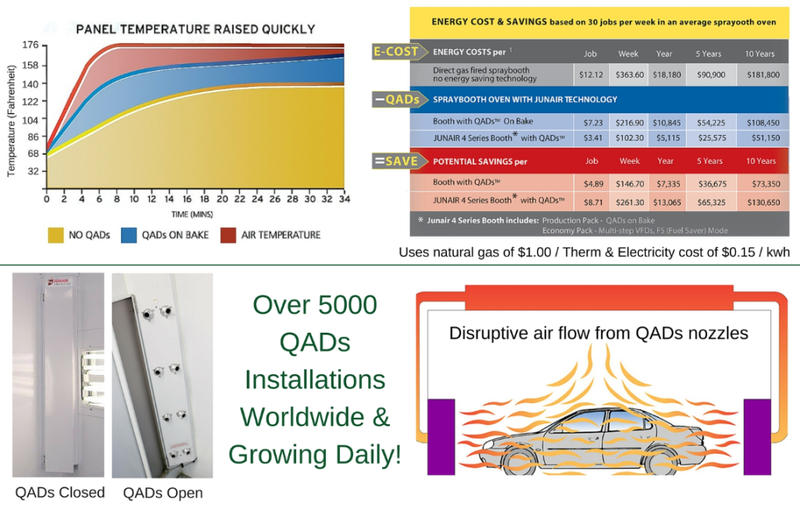 QADs can reduce overall paint drying & curing times up to 35%. It helps one spray booth to handle more jobs in the same amount of time. This substantially increasing your capacity and revenue without the need of an additional booth. The savings from lower energy consumption and the ability to process more vehicles ensures a rapid ROI. Conventional spray booths are inefficient at raising the temperature of an automotive’s lower panels to the required curing temperature. This is because hot air rises and less hot air sinks. Differences of 20 – 30 Fahrenheit are common in these kinds of conventional booths. This leads to extended baking times which eventually means less consumption. Heated air from the QADs surrounds the whole vehicle including the lower body panels. This ensures that the recommended curing temperature is achieved quickly. As specified by many of today’s paint manufacturers, spray booth ovens equipped with QADs will achieve a lower panel temperature of 140 Fahrenheit within 10 minutes.